Celia was helpful and responsive. Kimi was easily accessible and friendly via email and text. The Avalon house was perfect for our stay! We loved the quiet, gated neighborhood, and the very quick walk to the beach was a huge perk! All of the bedrooms were clean and comfortable, and the kitchen was stocked with everything we needed. We, along with our kids, loved riding bikes into Rosemary and Seacrest for shopping and eating. When we come back to Rosemary, we will definitely stay here again! There wasn't a lot of phone conversations, which personally, I prefer. I was a bit worried in the beginning because of the limited conversation as beach rentals in the past have included a lot of back and forth making the reservation. I did all of that online, which was quick and easy and convenient. As the reservation date approached, I received ample emails regarding the info I needed, and the staff was always quick to answer any questions I had regarding the property. All in all, I was very happy with the team. There are no words to describe how idyllic this property is for six families. It has plenty of space, but uses all the space efficiently. Kids were happy; parents were happy. Everything was very clean and well decorated. I was impressed with how well the layout of the house worked. The only complaint we had was the hour the kids (all elementary aged) got up as the pitter patter, or stomping rather, of their feet was loud over the second level were the majority of the adult bedrooms were. All in all though, this is our third year of bringing a large group to Santa Rosa Beach, and this is the only year that everyone has said that we have to get that house again next year. Anyone staying here won't be disappointed. Dylan was very quick to respond and resolve the issue with our wireless internet. He was also very helpful in answering all of our questions about the property prior to booking. All information he provided was accurate. Lots of stairs but great views and we loved how close the property was to the ocean and the pool. Pool water was warm which we loved! 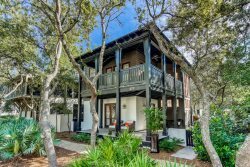 We also enjoyed that the property was within walking distance to Rosemary Beach, Seacreast Beach and Alys Beach restaurants. The 30A trail made for great walks every morning. I worked with Will during our trip and he was amazing! He was very attentive and quick to respond to any question or concern. We love this community and area! It has quickly become a favorite of ours and we have recommended it to many of our friends. The place is small, and the pictures posted were a perfect display of what you get. It was perfect for our needs! Location is great for morning coffee, mid-day breaks, and feeling like a part of the scene! thanks for a great vacation!! We had a team member come to our house shortly after we arrived and were given a large beach bag as a gift. That was a great surprise. And I needed it!! So it was put to good use and will continue to use in the future. It's those small things that make a huge difference to me.